Famous droid C3PO had a red arm In last year’s Star Wars The Force Awakens. The reason why was explained in a Marvel comic in April and then acted out in a bonus game level added to The Lego Star Wars The Force Awakens in August. The level is called “The Phantom Limb” and so far is only out for PS3 and PS4. That really stinks for everyone who doesn’t have a PlayStation, since it is both a good addition to Star Wars lore and a minor breakthrough in Lego game level design. In terms of lore, it replicates the story told in the comic. C3PO and a group of other droids have crashed on the planet Taul. Among them is the malevolent, chrome-plates protocol droid O-MR1, who works for the First Order. He taunts C3PO about the prospect that the famous golden droid may have also worked for the bad guys once and then had his memory wiped. But C3PO is used to talking back. “I feel quite certain that I have never associated with anyone who turned evil,” C3PO replies, as oblivious to the revelation in the Star Wars movie prequels that Anakin Skywalker built him as so many of the rest of us wish we could be. Without spoiling everything about the level, it should suffice to say that C3PO and O-MR1 have an adventure that leaves the former with a red arm. It’s a good, short story. It also unfolds across the first Lego video game level that I can recall that uses adversaries, in this case C3P0 and O-MR1, as the level’s two playable characters. These games always present two playable characters in a mission. A solo player can swap between the two, or a second player can drop in and control the other. Usually the two characters are on the same side: both are Rebels or DC supervillains or Harry Potter classmates or what have you. Pairing adversaries adds a tiny bit of tension to the standard pairing and is something the series’ designers might want to play with more. “The Phantom Limb” is a very good level. 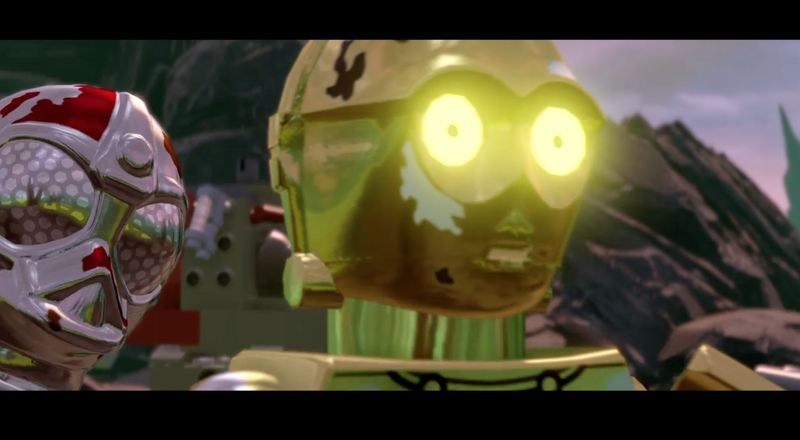 It even builds on a level that all Lego Force Awakens players can experience, a bonus mission called “Trouble Over Taul” that gives movie scene-stealer Captain Phasma a chance to shine in a mission that directly leads to C3PO and the other droids crashing. It’d be better for all players to see what happens next. Hitman - Kirk and Riley have been raving about it. I tried the training mission but haven’t gotten to the escalation missions that apparently make the game so great. The Witcher 3 - I’ve been playing this game on and off since launch. Mostly off, really, until this summer. I got back into it a month or so ago and just finished obsessively doing all of the sidequests possible for my level (18), through Velen and Novigrad. I only skipped the horse races. I don’t like them. On Sunday, I set sail to Skellige. I like the storytelling in the game but am not as enamored of its look and gameplay as others. I am taking a break from it for a bit. Black Ops III - Throughout the year, Mike, Kirk and I have dabbled with the newest Call of Duty’s co-op Zombies mode. We are way behind and just tried the second DLC’s Pacific map, Zetsubou No Shima. I’m convinced that the Gobblegum power-ups are the key to getting the most out of this mode. Mike and Kirk are skeptical. We played for an hour, my connection dropped and I appeared to drown. We played some more and turned on one of the two generators in the level. Turning on the power is usually the first step in a zombies map, so we are really early on. And probably about to get sucked into Destiny anyway. Inversus - This is a lovely black and white shooter that Mike really likes but that no one on PS4 seems to be playing, sadly. I tried matchmaking and no one connected. Bummer. Diaries of a Spaceport Janitor - Tried it. Didn’t really get it. It glitches. New weekend editor Ethan wrote about it. Read his impressions. Raw Data - Neat VR first-person shooter. Cosmic Trip - Still my favorite VR game, and it’s not even out of Early Access. Picross 3D Second Round - May it never end! Divinity: Original Sin 2 - I just started it and don’t have time to play much more in the near future. Also, I didn’t play the first one. Important?